To many, the average Muslim is an Arab who lives in the Middle East and speaks Arabic. However, only twenty percent of Muslims speak Arabic. 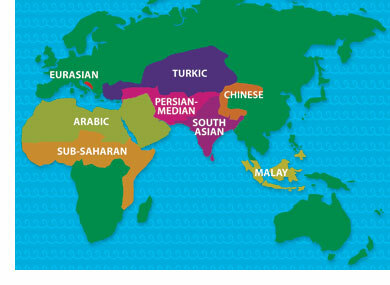 The majority do not live in the Middle East nor are ethnically Arab. The Muslim world today is incredibly diverse: Muslim populations fall into several cultural groups and numerous language subgroups located across the world. Ninety-eight percent of the world's more than 1.8 billion Muslims live in Asia and Africa and are broadly described by these seven cultural groups. Listed with each of the following seven cultural groups are some of their largest distinct people groups. Malay Muslims are concentrated in Southeast Asia, especially in the Philippines, Indonesia, and Myanmar, comprising 16% of the world's Muslims. Source: The Pew Forum on Religion and Public Life.